If making your own fruit filling, prepare ahead of time. Also, the best pan to use is a 9-inch springform. In a pinch, you could use a 9-inch flat bottomed brownie pan, etc. Either butter, or spray pan entirely on the inside. Preheat oven to 350 degrees F.
To prepare the streusel, mix the flour, sugar, vanilla sugar, salt and baking powder together in a bowl. Add cold butter chunks and the eggs. Mix by either rubbing the ingredients with your hands, or use a mixer on low speed. Alternatively, you can use dough hooks if you have them. Mix until crumbs are formed. Press 2/3 of the crumbs into the bottom and up the sides of the springform pan. Make the sides at least 1 inch tall. Make sure the dough is packed and no holes remain. Spoon the fruit filling over the dough, leaving about 1/4 – 1/2 inch from the edge of dough to filling center. Do not overdo it with the liquid, or else the cake will turn soggy. Using the remainder of the streusel dough, spread evenly over the entire top, and be sure to fill in the sides as well. The cake should generally be even across the top when you are finished. Bake in preheated oven for 45 – 55 minutes, or until the top is a golden brown. Allow to cool completely before serving, or else the cake may be runny. Serve with whipped cream or vanilla ice cream. **If the cake will not be finished in the first 48 hours, I would recommend placing in the refrigerator, and lightly warming in a toaster or warm oven. Only lightly! Otherwise you will over bake the crust and it will become hard. I just wanted to thank you for this recipe. I won’t have to buy Dr. Oetkers anymore! I lived in Munich for 5 years and got used to using the German cake mixes, but couldn’t find them regularly in the stores when we moved back to the USA. My favorite way of making this delicious cake is to take a pouch of vanilla pudding mix and only use 1 1/2 cups of milk instead of the 2 cups it calls for. Then take a 15 oz. can of apricot halves, drain them. 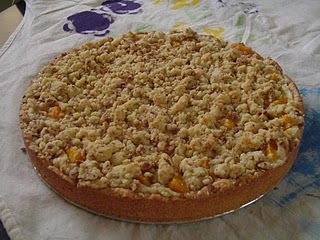 Pour the pudding into the crust you farmed with the 2/3 streusel mix and then arrange the apricot halves on that. Cover with remaining streusel mix and bake per recipe. It is fantastic! Again, thanks for this recipe! I had proper Kirschstreusel for the first time on a recent trip to Germany and vowed I had to learn to make it when I got home. After much googling I tried out this recipe this afternoon and it turned out so well! Absolutely delicious, thank you. Can I do this with out fruit? It has been over 22 years since I was in Germany but can still remember how WONDERFUL this cake was from the bread truck however mine did not have fruit in it. Hi Erica! I am not sure this would be the recipe to use for that. There is another variation which I believe utilizes more butter to have the appropriate consistency to stick. I have never tried this recipe without fruit, so I can’t say for certain. If I come across what you are looking for, I will post it. Thank you for reading! I’m new to baking..so, need to ask what oven temp is used for this recipe ? Kirschstreusel takes me back to my childhood growing up in West Berlin. Last time i had this cake was in 1991, definitely looking forward to baking this kuchen creating New memories with my kiddos. My Mother made this and now I also can do it. Can’t wait to try it. I found this recipe yesterday and made the cake last night. Reminded me of the times I spent with my Oma in the kitchen making this exact cake. The recipe was spot on and delicious. Thank you. I found what I believe to be this recipe a few years and a few computers ago. It was driving me crazy to find it tonight. I love making it. I have used canned pie filling for it and it’s always amazing I am thinking of filling it with something like a cannoli filling with fruit. It’s wonderful because you can experiment. Thank you.